Ridges Rock! As Peter Croft says, "it's like being on the summit all day long." They also happen to be somewhat easier climbing than their adjacent faces, they dry faster, and they keep one above the rockfall and avalanche hazard that plague some mountain sides. Here in the Sierra, we have amazing ridges. The most famous are the big granite gendarme'd traverses: The Palisade Traverse, the Evolution Traverse, and their smaller cousins all along the range. But it doesn't have to be a multi-peak traverse, nor does it have to be in the granite zone. In fact, some of our best climbs are the single day, "roadside" ascents on the front-range peaks. Up north that means metamorphic ridging. When I first moved to Bishop the Nevahbe Ridge was real trendy. Seemed like everyone was giving it a go and coming back to tell their tale. Funny how even the most permanent of geologic features can come and go in fashion. Alex and I did an ascent of the Nevahbe Ridge a couple weeks back. I had never jumped on the bandwagon back in the early 2000's, but I am glad we finally got there. The descent was fairly chill, if not exactly certain. We spent about equal time on snow and scree. 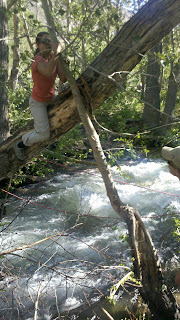 At the end we rigged a sweet tyrolean traverse across the river, rather than reverse the sketchy tree-to-tree transfer. The Nevahbe was a good tune-up for the alpine climbing season, as well as a lovely social day out in the mountains. The very next week Alex and I climbed the North Ridge of Lone Pine Peak. This route is one I had done way back in 2004 as one of my first big alpine climbs in the range. It was a serious outing for me then. It is still a serious outing, and it was nice to return and climb in a similar style with far greater confidence in route-finding, movement, and risk-management abilities. Alex is a rock-star alpine climbing partner, and rallied for a committing climb in uncertain conditions while under the weather with allergies. The wind both buffetted us on the ridge and stirred up allergens that seem to plague so many desert denizens in a wet spring like we have had. We climbed and climbed, using the rope just a little, and less and and less as the climb went on. It's fair to say we got in the groove. What a day we had! Looks gnarly, props for outwitting that creek!